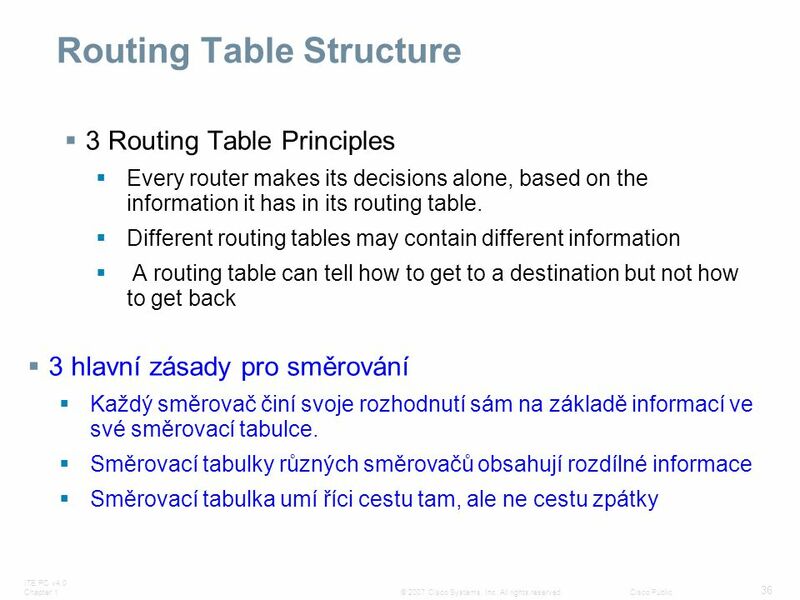 5 Router as a Computer Routers examine a packet’s destination IP address and determine the best path by the aid of a routing table Směrovací tabulku používá jako mapu Router zjistí cílovou IP adresu paketu a ve směrovací tabulce nalistuje nejlepší cestu. 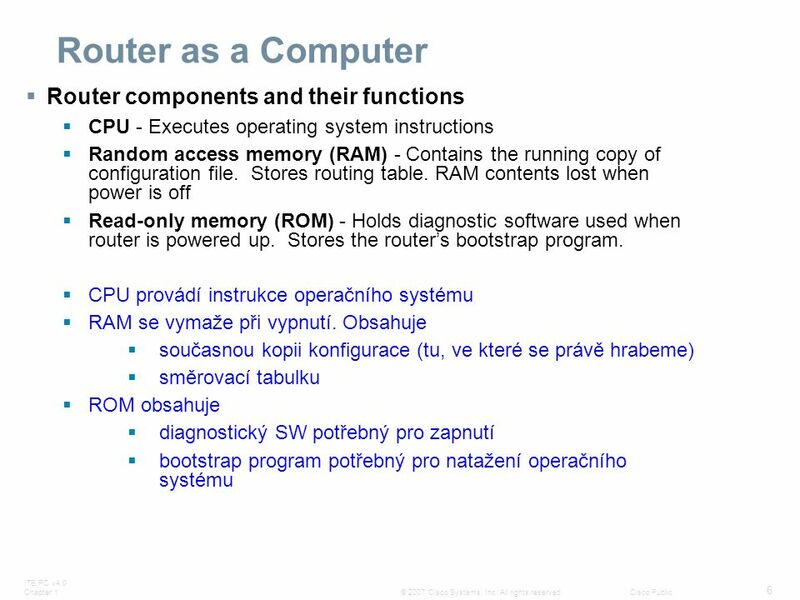 Router as a Computer Steps in Router Initialization Kde najde co a udělá co OBDOBA V PC: Spustí BIOS, udělá základní kontroly Vyhledá DOS, spustí ho Vyhledá konfigurační soubory (config, autoexec) a zařídí se podle nich Step 1 -- The generic bootstrap loader, in ROM, executes on the CPU card. A bootstrap is a simple, preset operation to load instructions that in turn cause other instructions to be loaded into memory, or cause entry into other configuration modes. 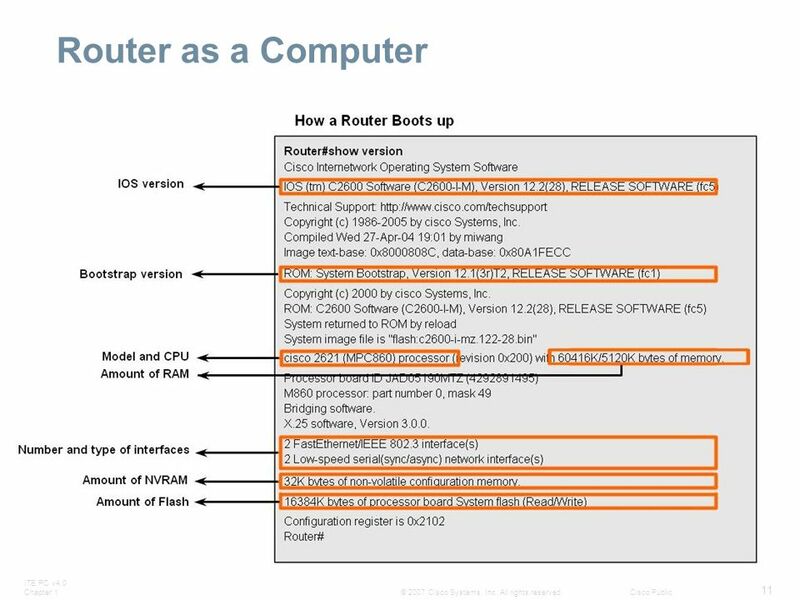 Step 2 -- The operating system (Cisco IOS) can be found in one of several places. The location is disclosed in the boot field of the configuration register. 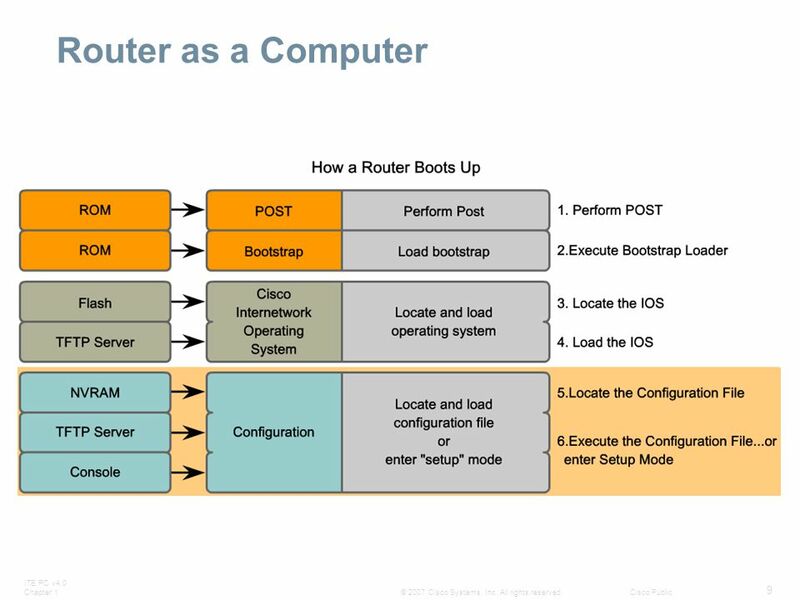 If the boot field indicates a Flash, or network load, boot system commands in the configuration file indicate the exact location of the image. Step 3 -- The operating system image is loaded. 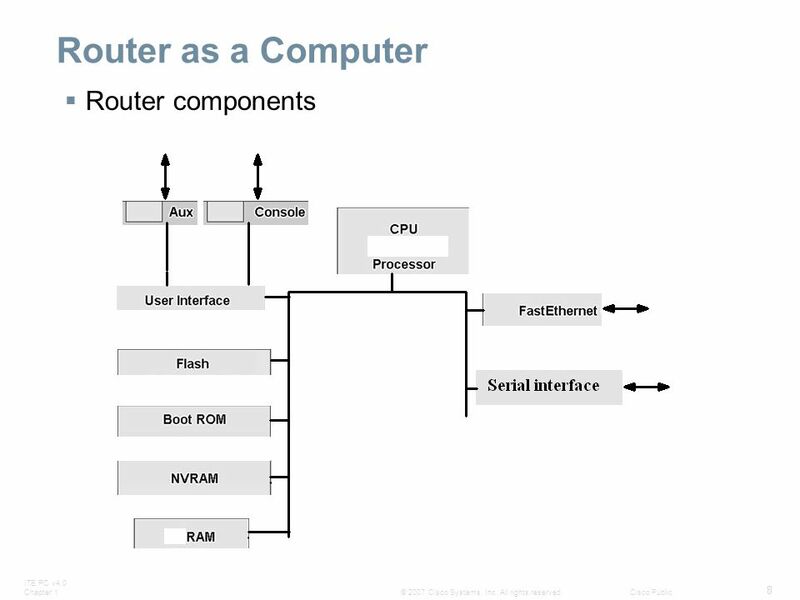 Then, when it is loaded and operational, the operating system locates the hardware and software components and lists the results on the console terminal. Step 4 -- The configuration file saved in NVRAM is loaded into main memory and executed one line at a time. 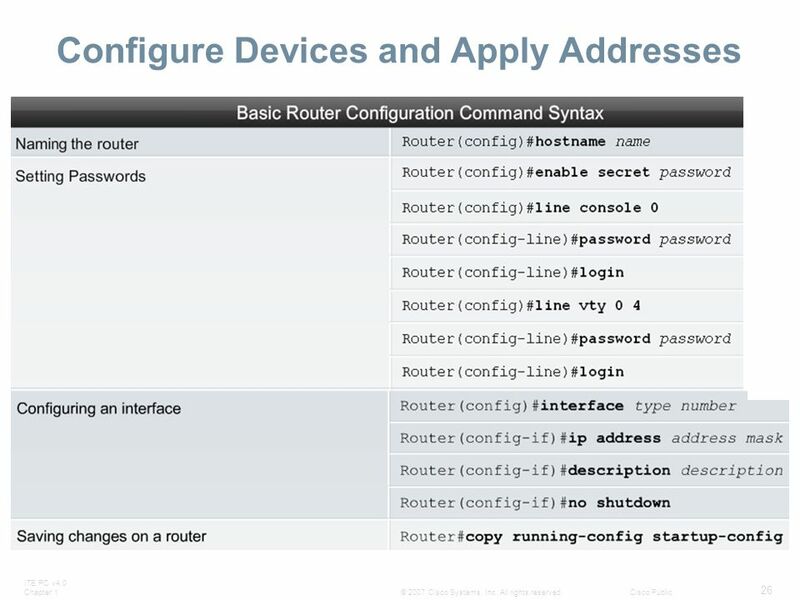 These configuration commands start routing processes, supply addresses for interfaces, set media characteristics, and so on. 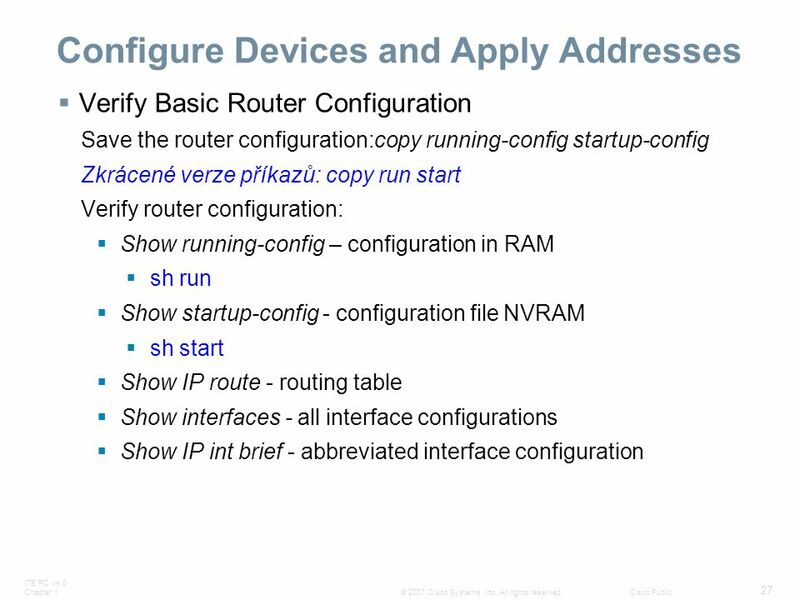 Step 5 -- If no valid configuration file exists in NVRAM, the operating system executes a question-driven initial configuration routine referred to as the system configuration dialog, also called the setup dialog. 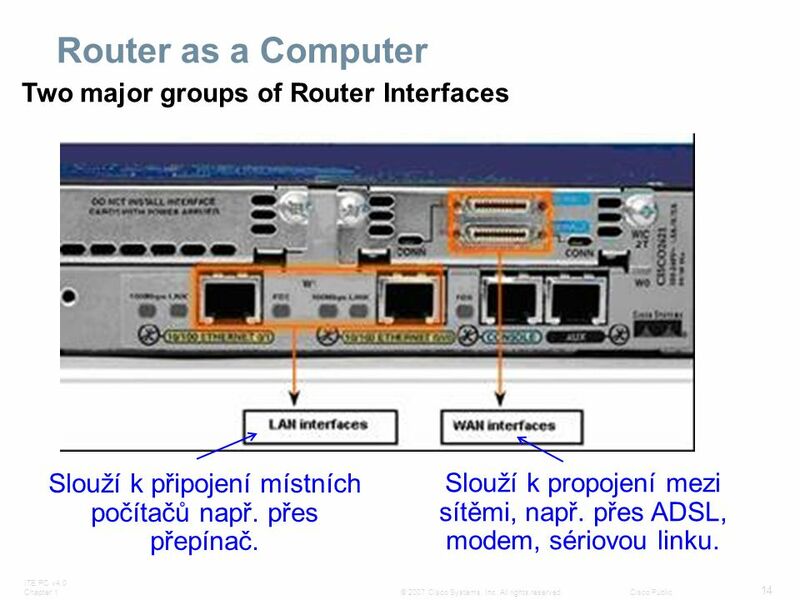 Na začátku jsme rozdělili interfaces na Ethernet Sériové Management = ovládací V dalším budeme pod „Router Interfaces“ rozumět především ty konektory, po kterých chodí pakety, tj. ethernet a sériové. 14 Slouží k připojení místních počítačů např. přes přepínač. 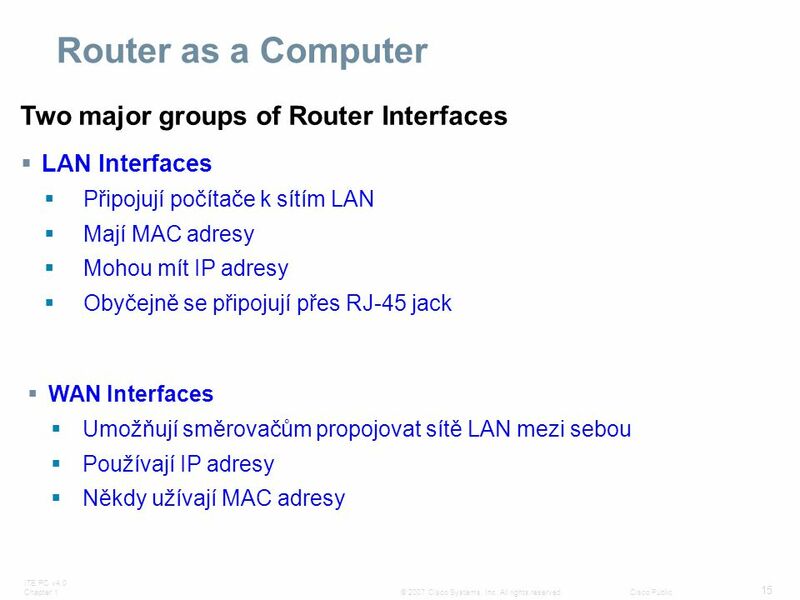 Router as a Computer Two major groups of Router Interfaces Slouží k připojení místních počítačů např. přes přepínač. Slouží k propojení mezi sítěmi, např. přes ADSL, modem, sériovou linku. Směrovače posílají pakety podle cílových IP adres: Směrovač určí cestu, kterou má paket poslat, po prostudování směrovací tabulky. Když směrovač určí nejlepší cestu, zabalí paket do framu. Pak vyšle frame na síťové médium jako jednotlivé bity. 17 Každý směrovač zkoumá především cílovou IP adresu. 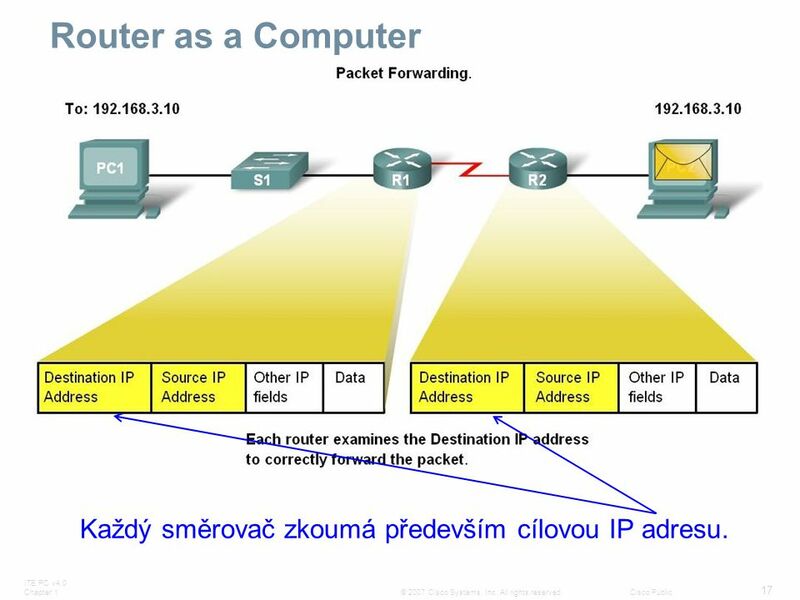 Router as a Computer Každý směrovač zkoumá především cílovou IP adresu. 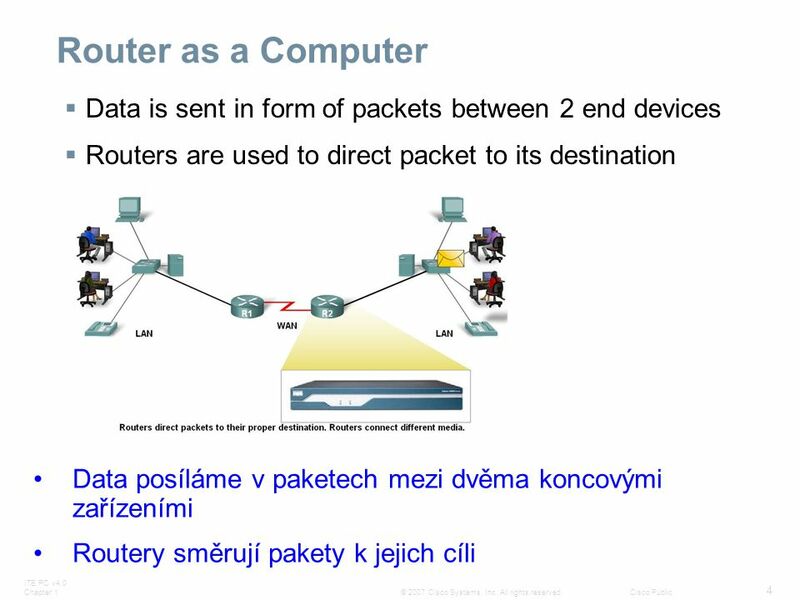 19 Router as a Computer Na koncových počítačích se ve vrstvách 7, 6, 5, 4 data zpracují, poskládají, zobrazí. 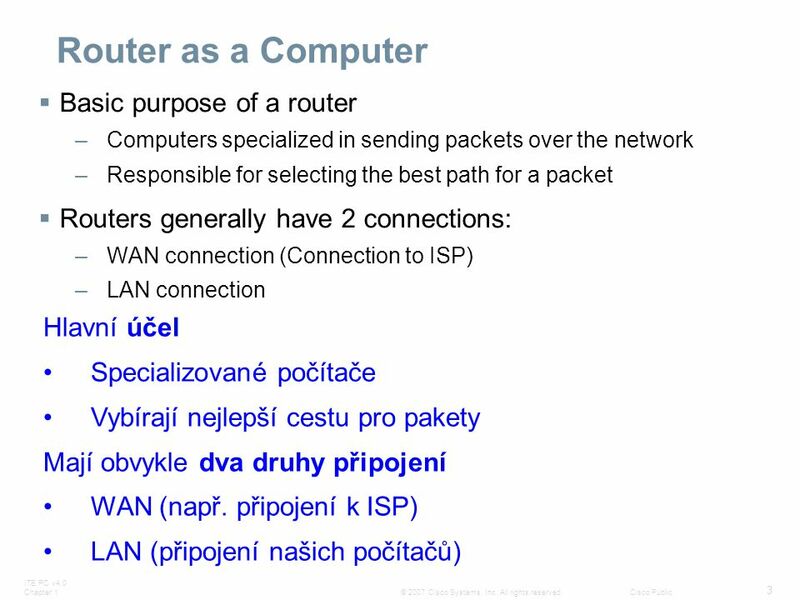 20 Router as a Computer Na směrovačích po trase se pracuje s bity na vrstvě 1 – fyzické, s framy a MAC adresami na vrstvě 2 - datové, s pakety a IP adresami na vrstvě 3 – síťové. 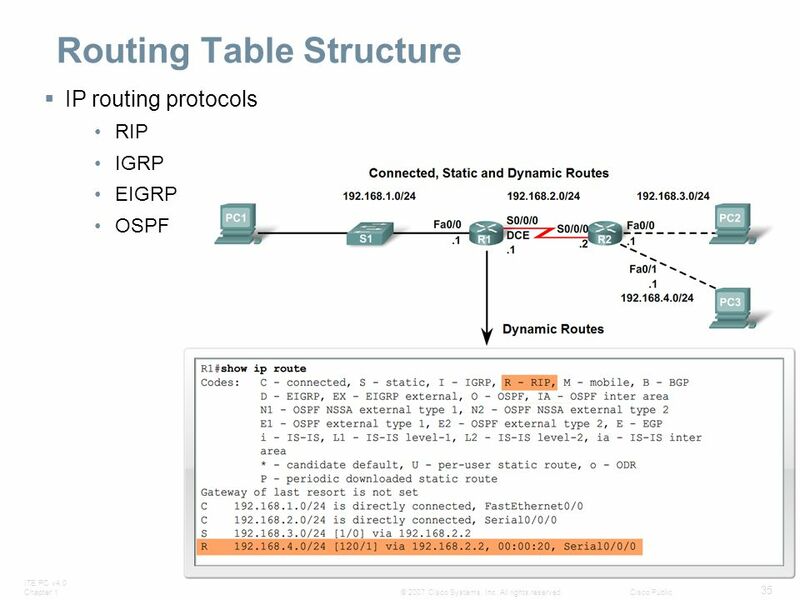 Effects of the 3 Routing Table Principles Packets are forwarded from one router to another, on a hop by hop basis. 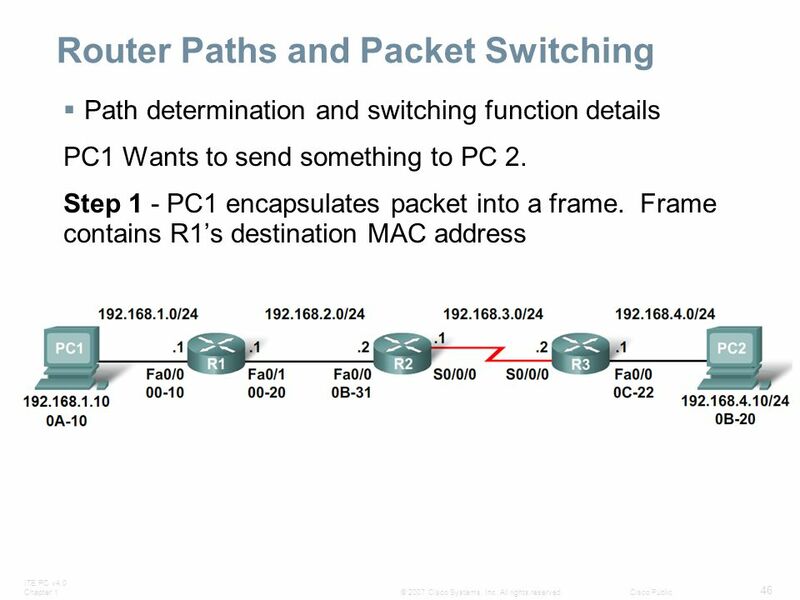 Packets can take path “X” to a destination but return via path “Y” (Asymmetric routing). Důsledky tří hlavních zásad Pakety jsou směrovány od jednoho směrovače ke druhému, skok za skokem. Pakety mohou jít „tam“ jednou cestou, zpátky jinou (asymetrické směrování). 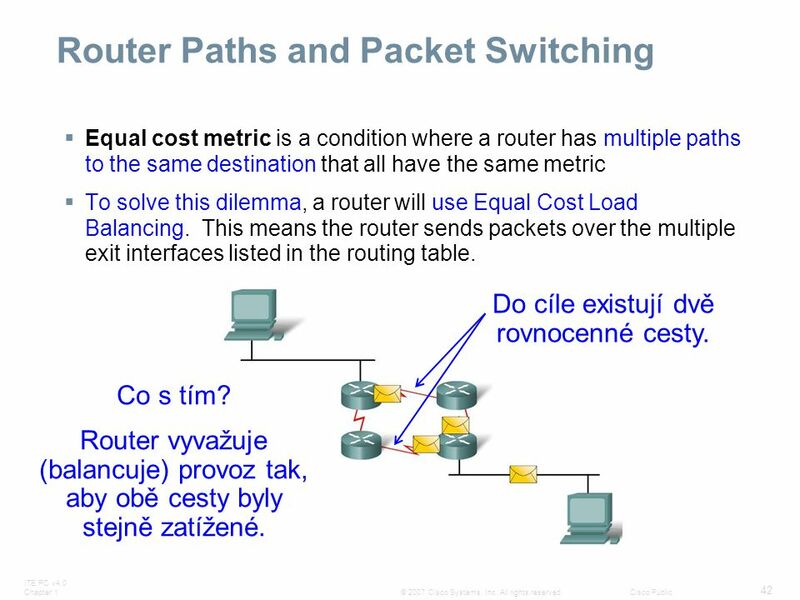 Equal cost metric is a condition where a router has multiple paths to the same destination that all have the same metric To solve this dilemma, a router will use Equal Cost Load Balancing. 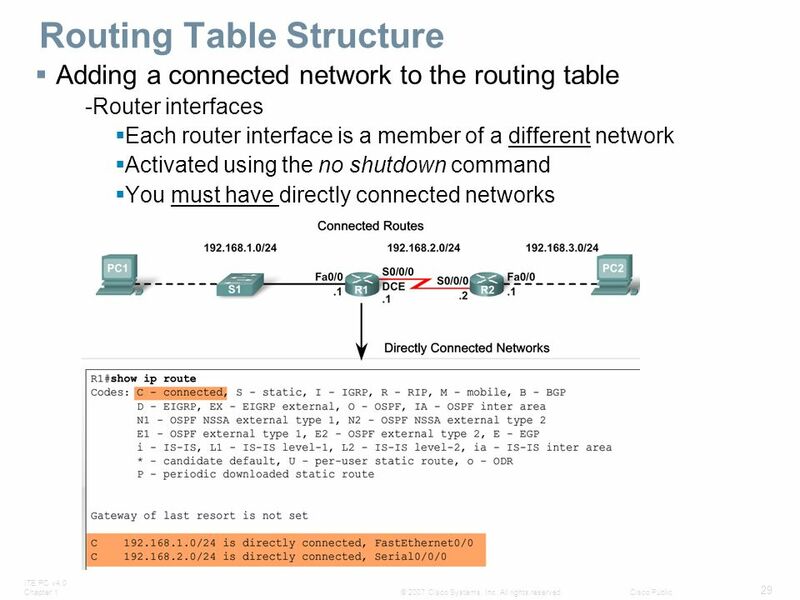 This means the router sends packets over the multiple exit interfaces listed in the routing table. Do cíle existují dvě rovnocenné cesty. Co s tím? 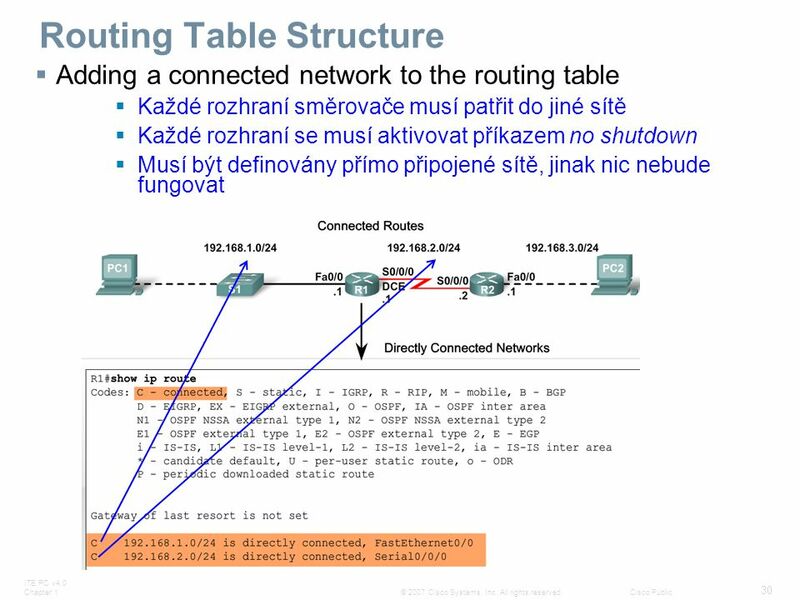 Router vyvažuje (balancuje) provoz tak, aby obě cesty byly stejně zatížené. 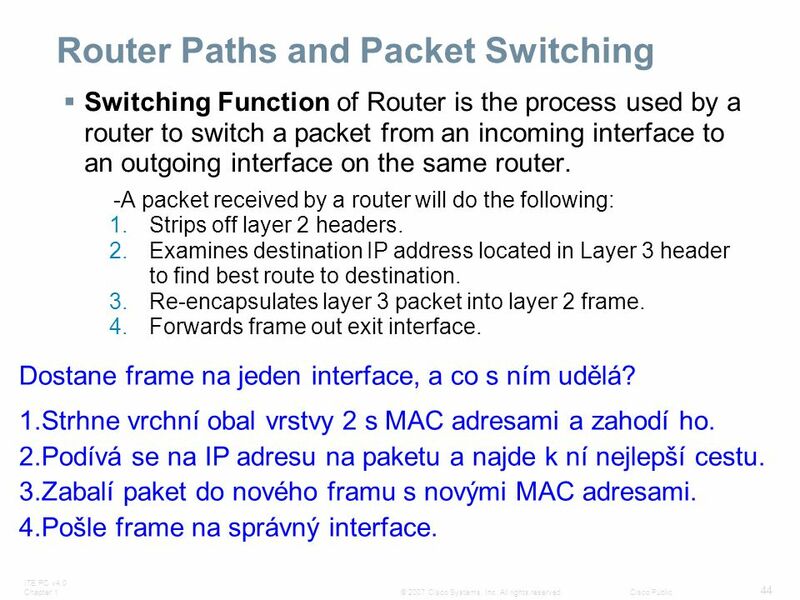 Switching Function of Router is the process used by a router to switch a packet from an incoming interface to an outgoing interface on the same router. 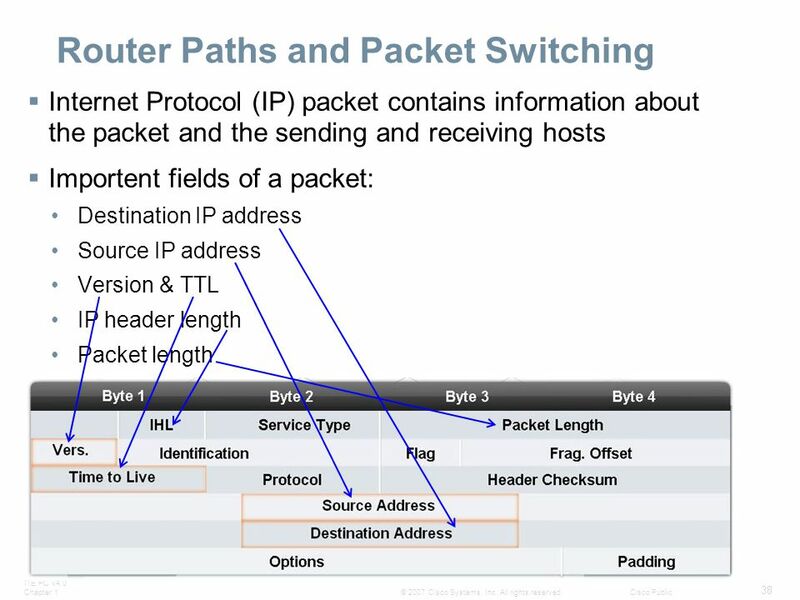 -A packet received by a router will do the following: Strips off layer 2 headers. 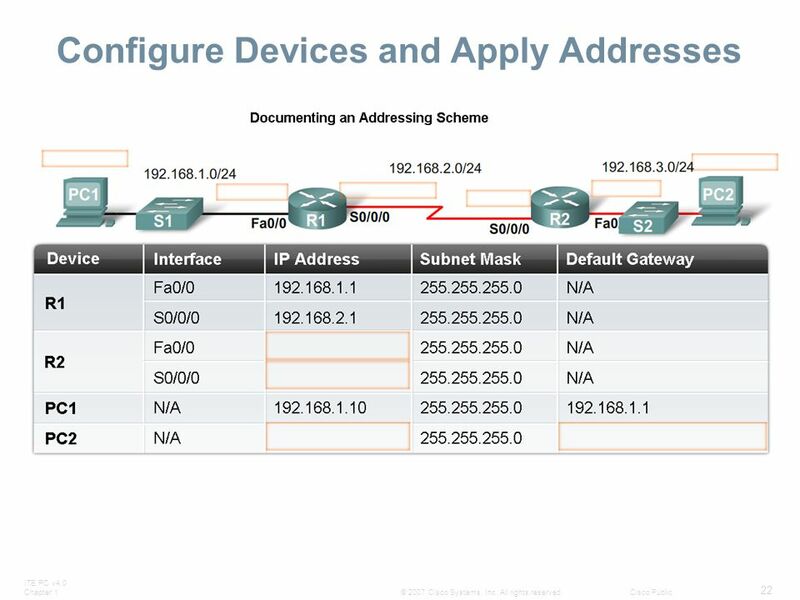 Examines destination IP address located in Layer 3 header to find best route to destination. Re-encapsulates layer 3 packet into layer 2 frame. Forwards frame out exit interface. Dostane frame na jeden interface, a co s ním udělá? Strhne vrchní obal vrstvy 2 s MAC adresami a zahodí ho. Podívá se na IP adresu na paketu a najde k ní nejlepší cestu. Zabalí paket do nového framu s novými MAC adresami. Pošle frame na správný interface. 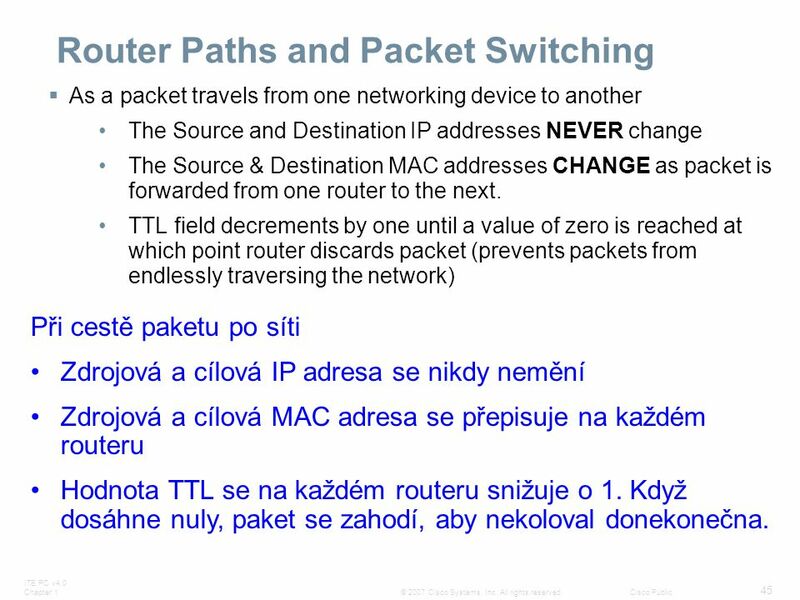 As a packet travels from one networking device to another The Source and Destination IP addresses NEVER change The Source & Destination MAC addresses CHANGE as packet is forwarded from one router to the next. TTL field decrements by one until a value of zero is reached at which point router discards packet (prevents packets from endlessly traversing the network) Při cestě paketu po síti Zdrojová a cílová IP adresa se nikdy nemění Zdrojová a cílová MAC adresa se přepisuje na každém routeru Hodnota TTL se na každém routeru snižuje o 1. Když dosáhne nuly, paket se zahodí, aby nekoloval donekonečna. Step 2 - R1 receives Ethernet frame. 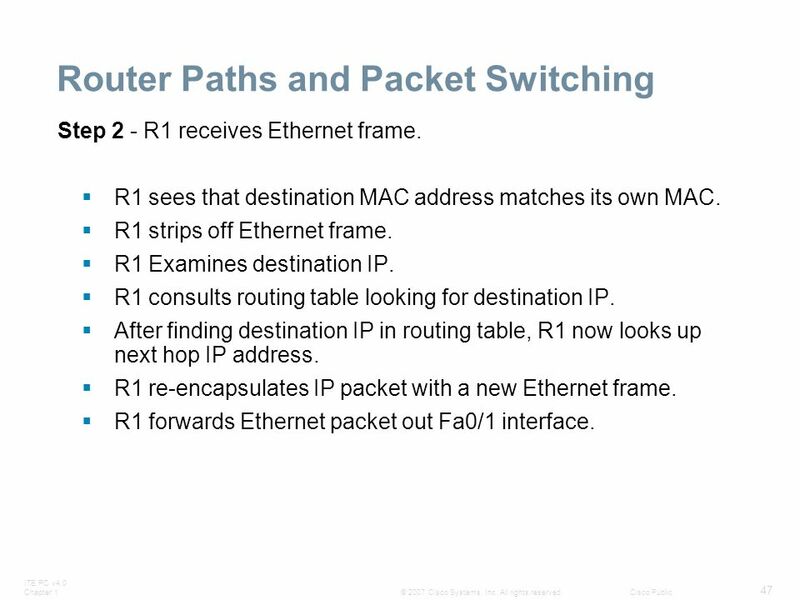 R1 sees that destination MAC address matches its own MAC. R1 strips off Ethernet frame. R1 Examines destination IP. 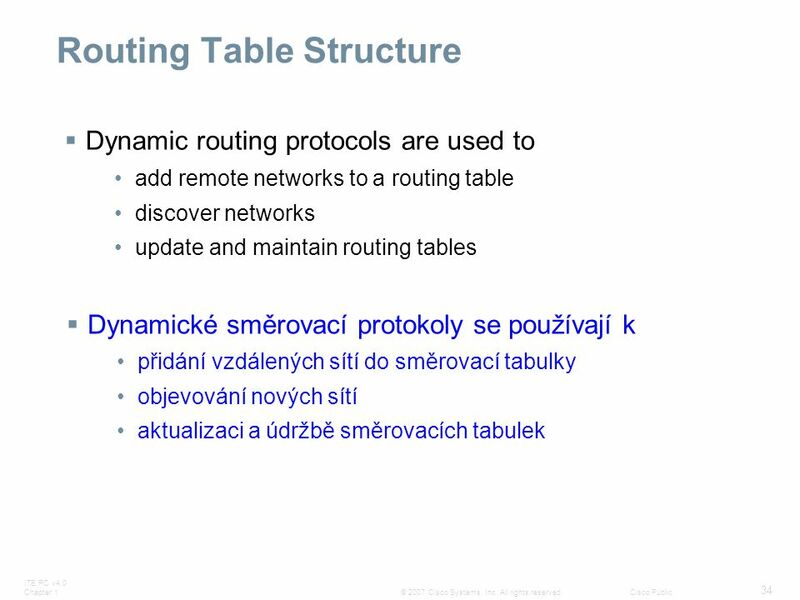 R1 consults routing table looking for destination IP. 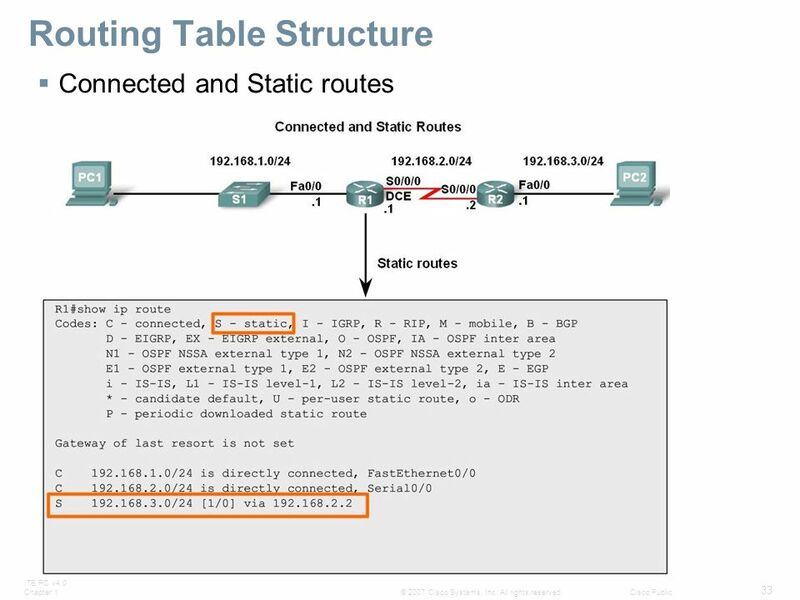 After finding destination IP in routing table, R1 now looks up next hop IP address. 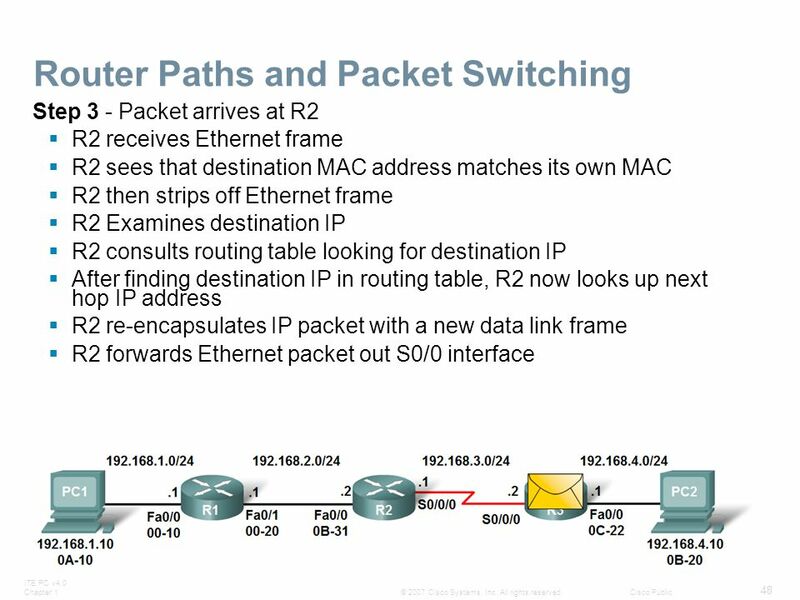 R1 re-encapsulates IP packet with a new Ethernet frame. 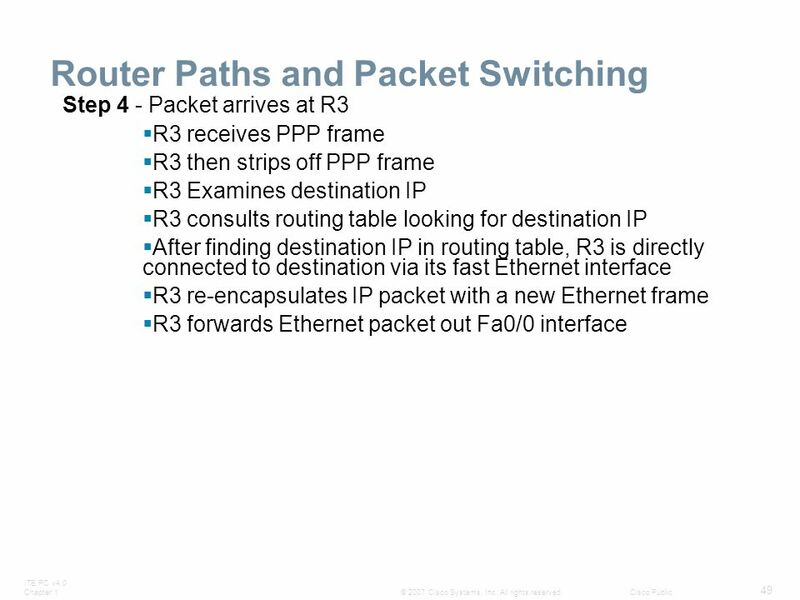 R1 forwards Ethernet packet out Fa0/1 interface. Step 5 - IP packet arrives at PC2. Frame is decapsulated & processed by upper layer protocols. 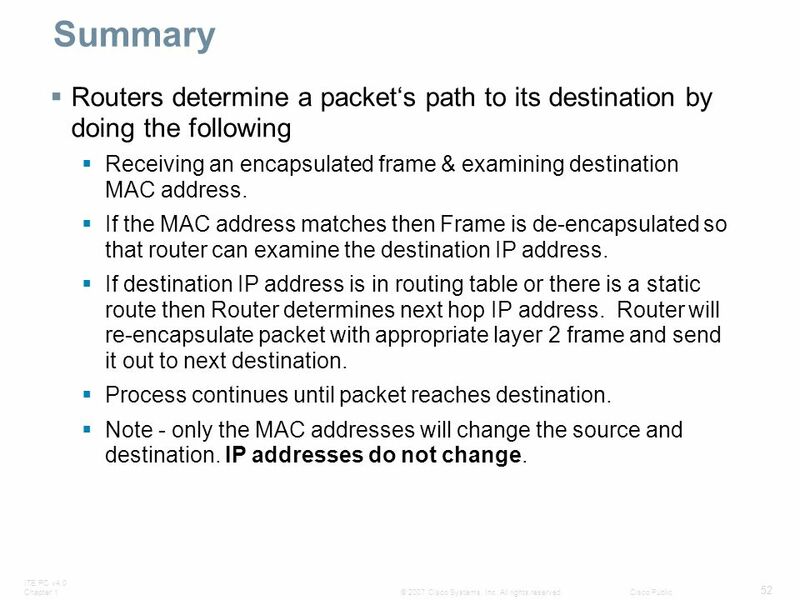 52 Summary Routers determine a packet‘s path to its destination by doing the following Receiving an encapsulated frame & examining destination MAC address. 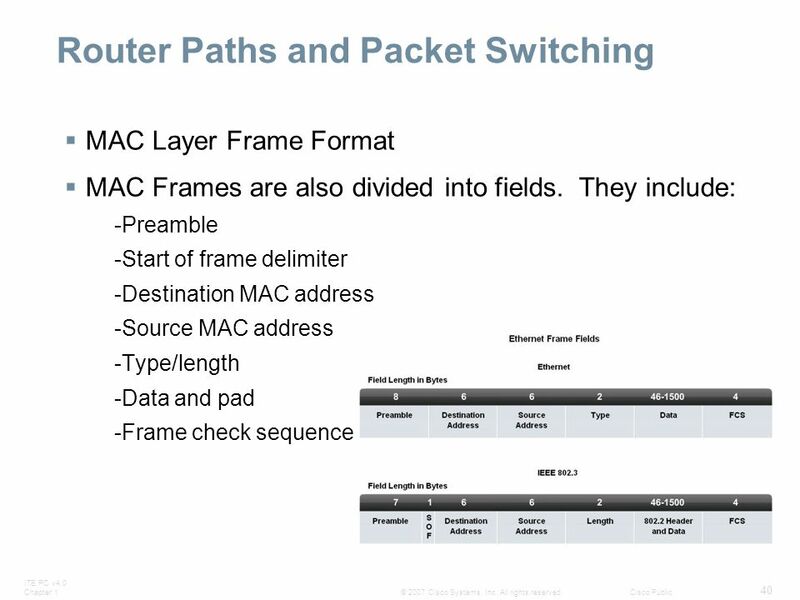 If the MAC address matches then Frame is de-encapsulated so that router can examine the destination IP address. 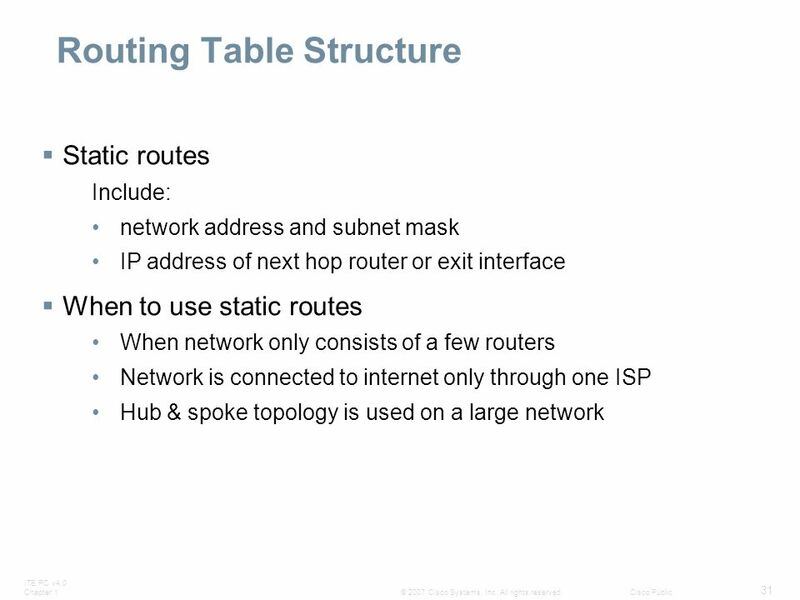 If destination IP address is in routing table or there is a static route then Router determines next hop IP address. 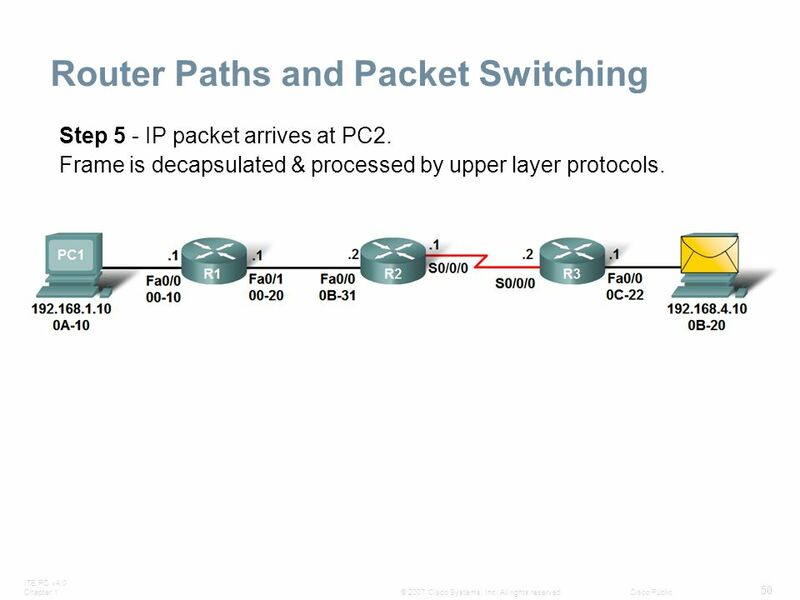 Router will re-encapsulate packet with appropriate layer 2 frame and send it out to next destination. Process continues until packet reaches destination. 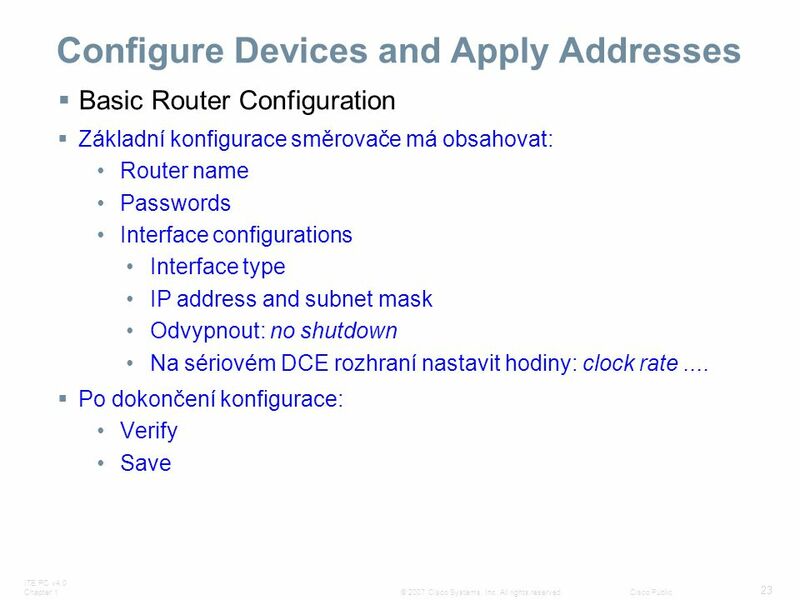 Note - only the MAC addresses will change the source and destination. IP addresses do not change. 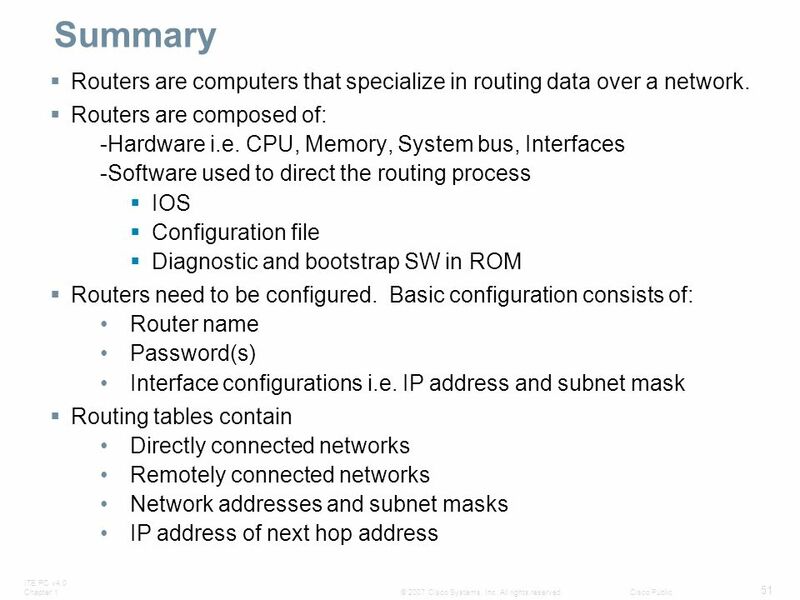 Stáhnout ppt "Introduction to Routing and Packet Forwarding"
1 © 2004, Cisco Systems, Inc. All rights reserved. 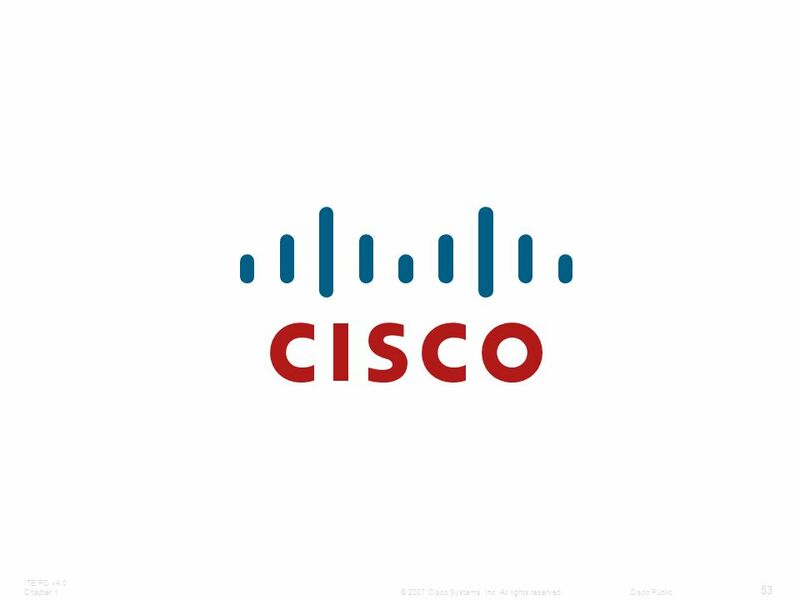 CCNA 2 v3.1 Module 5 Managing Cisco IOS Software. 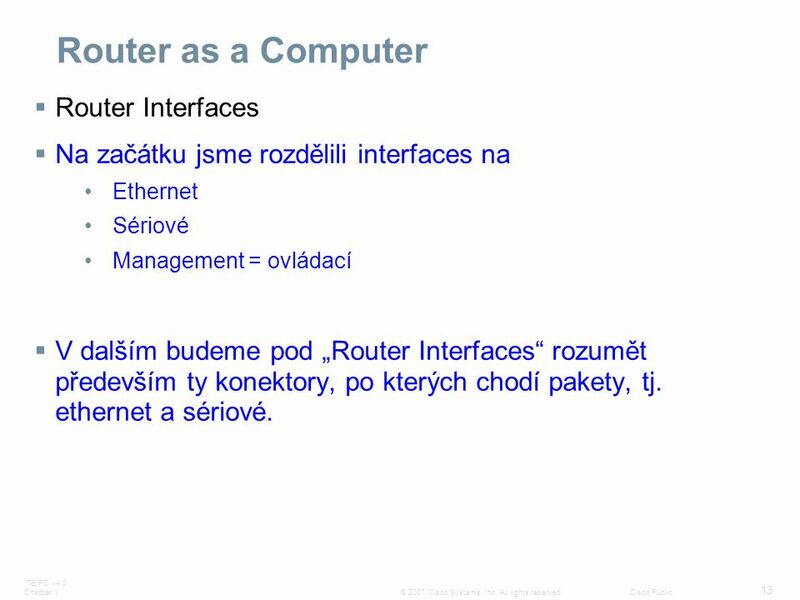 © 2006 Cisco Systems, Inc. All rights reserved.Cisco PublicITE I Chapter 6 1 Inter-VLAN Routing LAN Switching and Wireless – Chapter 6. 1 © 2004, Cisco Systems, Inc. All rights reserved. 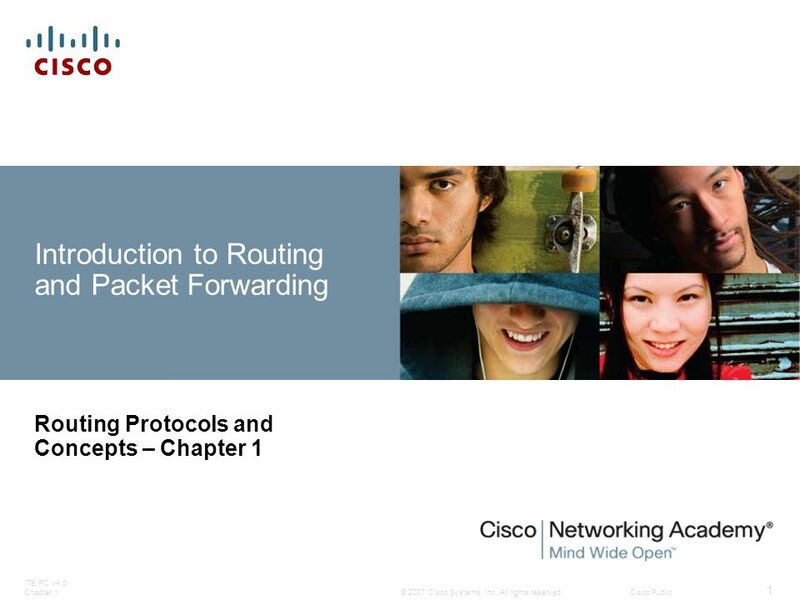 CCNA 2 v3.1 Module 6 Routing and Routing Protocols. 1 © 2004, Cisco Systems, Inc. All rights reserved. 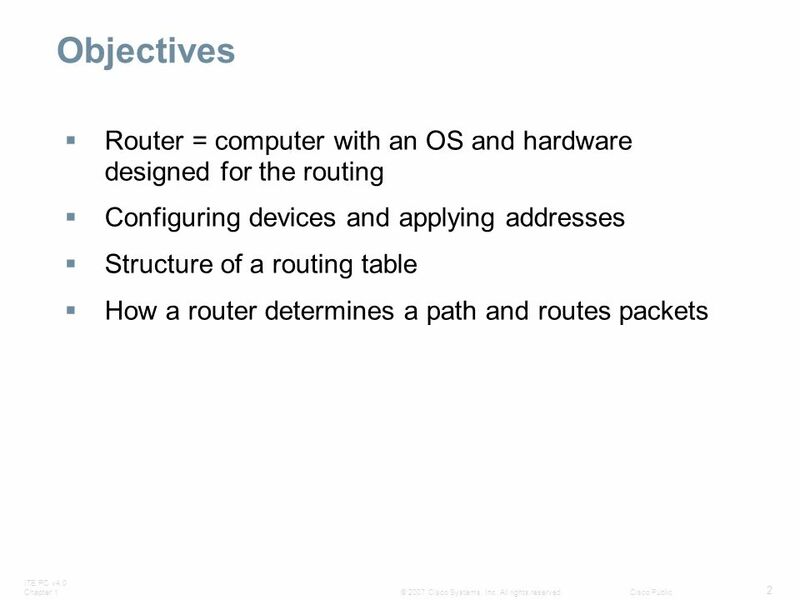 CCNA 2 v3.1 Module 2 Introduction to Routers. 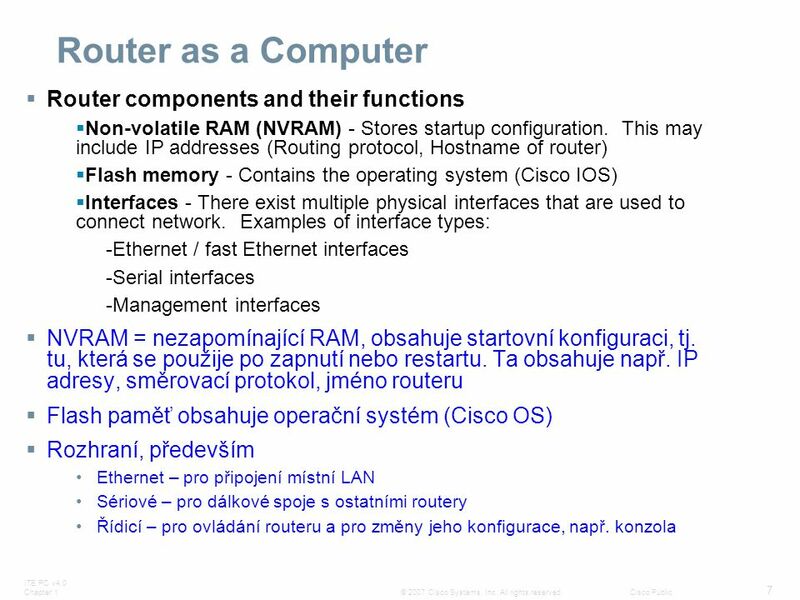 © 2007 Cisco Systems, Inc. All rights reserved.Cisco Public 1 Version 4.0 OSI Transport Layer Network Fundamentals – Chapter 4. 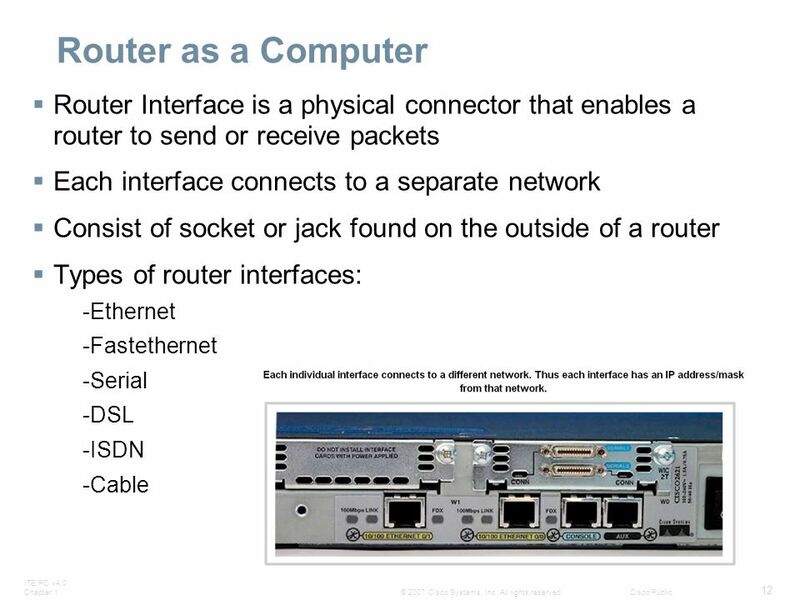 © 2007 Cisco Systems, Inc. All rights reserved.Cisco Public 1 Ethernet Network Fundamentals – Chapter 9. 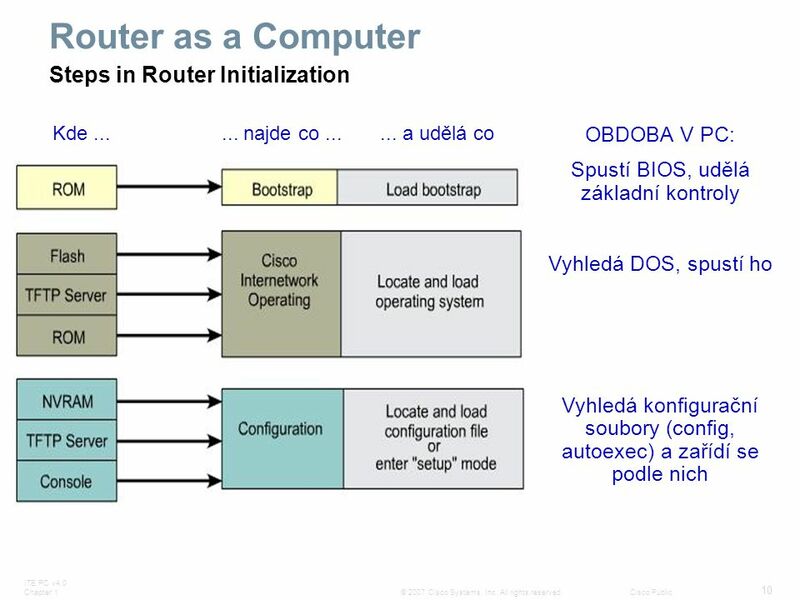 © 2006 Cisco Systems, Inc. All rights reserved.Cisco Public 1 Version 4.0 Services in a Converged WAN Accessing the WAN – Chapter 1 síť, která přenáší. 1 © 2004, Cisco Systems, Inc. All rights reserved. 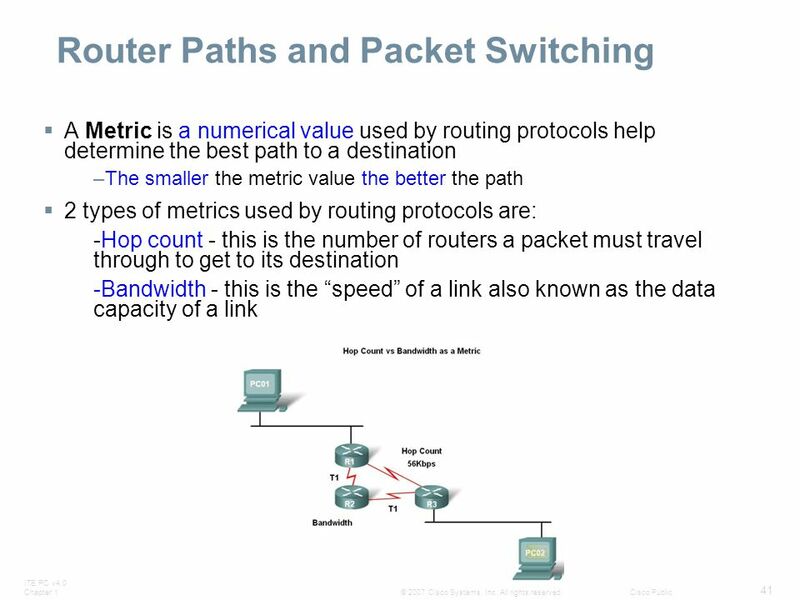 CCNA 2 v3.1 Module 7 Distance Vector Routing Protocols. 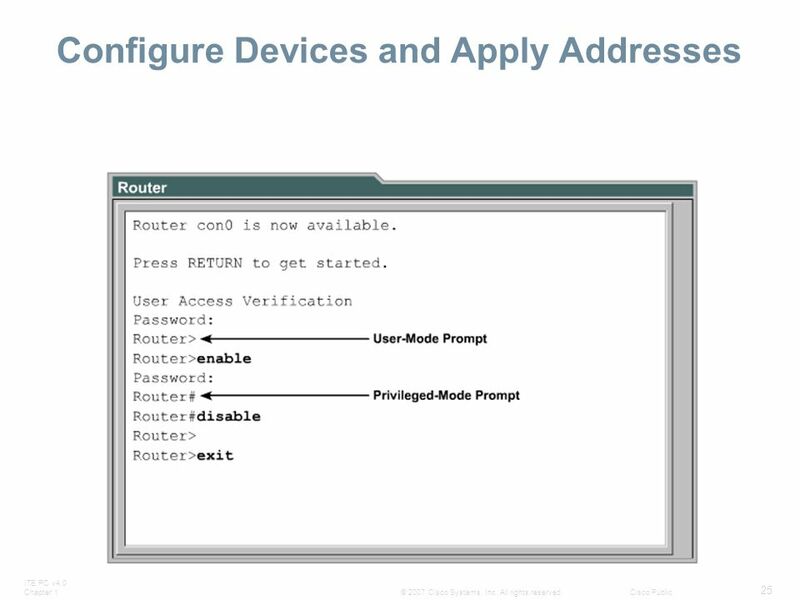 © 2006 Cisco Systems, Inc. All rights reserved.Cisco Public 1 Version 4.0 Access Control Lists Accessing the WAN – Chapter 5.